Providing automatic self-cleaning filtration systems for removal of suspended solids from water is more than a job for Orival — it's a way of life. Since its establishment in 1986, Orival has supplied thousands of filtration units, for a wide variety of customers, including Fortune 500 companies and local and federal government agencies. Units are installed in over 40 countries worldwide, meeting any local standard. 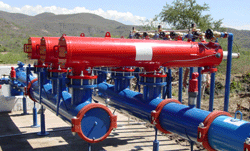 Single units, flange-to-flange systems, complete skid mounted packages, construction standards (i.e. ASME, API, etc. ), alternate flange or voltage standards — all are no problem for Orival. No matter what your requirements, we can build it! Orival enters all projects with the same sense of commitment regardless of size, application or location. Product support and customer satisfaction are of the utmost importance to Orival and its experienced representatives. From single filters to complete multi-stage filtration systems, we will ensure you get the right filter to fit your needs. Orival's network of application specialists will provide expert solutions tailored to your specific needs. Contact us today for a free consultation and/or application evaluation to see how we can help you resolve your water problems. After all, solving your filtration requirements is what we live for. 213 South Van Brunt St.